Son of Moses Navarro, body-physician of Pedro I. of Portugal; "tesoreiro é almoxarife mór" (treasurer and receiver-general of taxes) of Pedro I. and John I. of Portugal, a post which, after a few years, was taken from him and transferred to Moses Gavirol (Chavirol). In 1375 the king again appointed him receiver-general. D. Judah, who was exceedingly wealthy, made a present to the king of a large estate, enriched with orchards and vineyards, situated in Alvito, Alemtejo. From Jan. 1, 1378, he paid for five years the enormous sum of 200,000 livres yearly for the lease of taxes. In consideration of this he was granted the privilege of proceeding unhindered and with the utmost strictness against all delinquent taxpayers. This right was granted to his agents also, among whom was a relative of his by the name of Jacob Navarro. Rios, Hist. ii. 278 et seq. Body-physician to King Pedro I. of Portugal and "arrabi mór" (chief rabbi) of the Portuguese communities; died in Lisbon about 1370. By royal permission he assumed the name of his birthplace, which he left in consequence of the persecutions there. D. Moses Navarro, who held the office of receiver-general of taxes, stood high in the favor of the king, which advantage he utilized on several occasions in behalf of his coreligionists. It was probably at his suggestion that many laws concerning the inner relations of the community were modified, as those regarding the reelection of the rabbi and the officers of the congregation. He possessed a large estate in the neighborhood of Lisbon. Moses filled the office of chief rabbi for nearly thirty years. Rios, Hist. ii. 266 et seq., 271. Son or (according to Rios, "Hist.") grandson of Moses Navarro (see above); Portuguese chief rabbi and "almoxarife," and body-physician of King John I.; died about 1410. 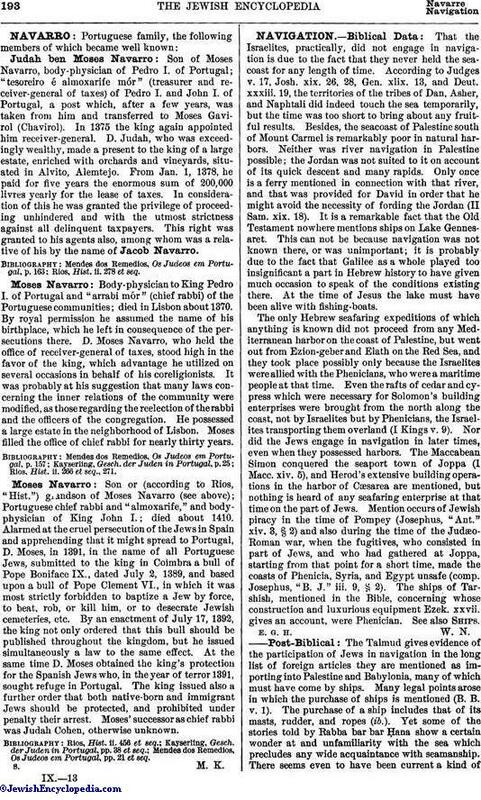 Alarmed at the cruel persecution of the Jews in Spain and apprehending that it might spread to Portugal, D. Moses, in 1391, in the name of all Portuguese Jews, submitted to the king in Coimbra a bull of Pope Boniface IX., dated July 2, 1389, and based upon a bull of Pope Clement VI., in which it was most strictly forbidden to baptize a Jew by force, to beat, rob, or kill him, or to desecrate Jewish cemeteries, etc. By an enactment of July 17, 1392, the king not only ordered that this bull should be published throughout the kingdom, but he issued simultaneously a law to the same effect. At the same time D. Moses obtained the king's protection for the Spanish Jews who, in the year of terror 1391, sought refuge in Portugal. The king issued also a further order that both native-born and immigrant Jews should be protected, and prohibited under penalty their arrest. Moses' successor as chief rabbi was Judah Cohen, otherwise unknown. Mendes dos Remedios, Os Judeos em Portugal, pp. 21 et seq.